Millions of Californians and out-of-state visitors annually visit permanent amusement parks such as Disneyland, Magic Mountain, Universal Studios, and Knott’s Berry Farm and go on amusement rides. 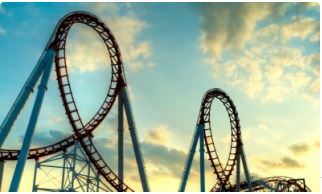 Many of these rides are “thrill rides” that travel at a high rate of speed and make sudden turns or changes in elevation, abrupt starts and starts and other sudden maneuvers that cause you to instantly change from one position to another or put pressure on various parts of your body or your brain. In addition to permanent amusement parks, millions of people visit the annual county fair that brings with it a traveling Midway equipped with dozens of amusement rides for young and old. Then there are church fairs and private birthday parties where people rent inflatable slides and “moon bounce” castles for youngsters to frolic in. And some people dare to go bungee jumping, to experience the freedom of a free fall, only to be recoiled when they reach the rope’s end. Unfortunately, a significant number of people are seriously injured or killed by an amusement or recreational ride that malfunctions because of faulty operation, maintenance, design, or construction, or the lack of warnings regarding the age, height, weight, and medical condition of the prospective rider. Injuries may range from a few cuts and bruises, to the loss of limbs. In some cases, the injured rider may suffer broken bones ranging from a broken arm or leg to a broken back that leaves the rider paralyzed from the neck down (“quadriplegic”) or in their lower body (paraplegic). Some amusement ride riders are thrown from their car because of the lack of a safety bar or a defective seat belt, or the car itself may detach from the ride because of worn or missing bolts, causing serious injury to the rider. In some cases, the rider is killed because of a defective ride or the negligence of the owner or operator in inspecting and maintaining the ride every day to ensure its safety. In inflatable rides, they may not be securely anchored and flip over in a gust of wind, causing serious injuries to the users. Or they may suddenly deflate, causing the users to fall to the ground headfirst, causing severe injuries, even death. whether the ride carried persons around a course (such as a roller coaster or thrill ride) or was stationary (such as a bouncy castle or rock-climbing wall). The California “assumption of risk” doctrine applies when you voluntarily participate in activities that can be hazardous or cause injuries. When you go skateboarding, you assume the risk that you might fall and get hurt. When you go to watch a baseball game, you assume the risk that you might get hit by a foul ball. The California Supreme Court has ruled that the doctrine of assumption of risk applies to some injuries sustained by visitors to amusement parks. The court said, “A small degree of risk inevitably accompanies the thrill of speeding through curves and loops, defying gravity or, in bumper cars, engaging in the mock violence of low-speed collisions.” By participating in amusement park attractions, you voluntarily take on some minor, inherent risk, such as breaking your wrist if you brace yourself against a bumper car collision. However, just because you assume some minor risk when you go to an amusement park doesn’t mean that the park is absolved from all liability if you were injured. Defective rides, inadequately trained workers and insufficient safety instructions may give rise to a claim against an amusement park or the manufacturer of an attraction if you suffer an injury. Injured visitors to parks regularly make claims that are paid by these parties or their insurance companies. If you have been injured on an amusement park ride, a traveling carnival ride, a private birthday party that rented defective rides and inflatables, bungee jumping, or other amusement or recreational activity, you should seek medical attention as soon as possible. For instance, that dizziness or nausea you feel after a thrill ride may be symptomatic of a serious brain injury that requires immediate treatment. If you have been injured or a loved one killed in an amusement ride accident, you should contact an experienced personal injury lawyer as soon as possible. This gives the lawyer the chance to see the accident scene and check out the ride before the owner/operator has the chance to make any modifications to it.